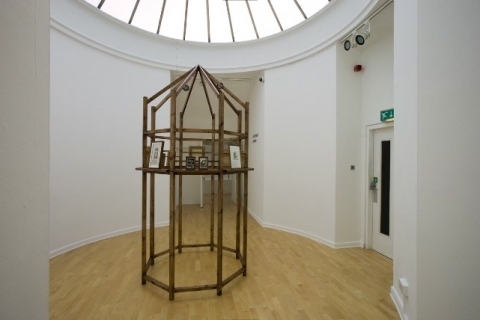 This work is both a response to the structure of the round room in which it is ensconced as well as a reaction to the notion of architectural follies, an esoteric subject which has held the interest of the artist for at least the last year. Following the meandering but consistently bold line of her research, one can clearly see the parallels of the Pavilion with the neo-classical architectural spririt that inspired the construction of several "follies" in the UK over the last 250 years. Combined with the artist's sensitive drawings derived from movement schools born of the Bauhaus era and avant garde films featuring early performance art-within-architecture, the Pavilion is at once cleverly constructed and structurally ambiguous. This effect is not accidental, as the paradox refers to folly architecture and its ostentatious display of self, which is further reiterated by the photographs of herself the artist has covertly included in the carefully framed imagery set within/against the structure. The Pavilion is to be appreciated for its subtle esoteric humour and its likelihood of becoming garden furniture.